Which Fast-Food Chains Serve Booze? Now that Taco Bell's gonna be serving up alcoholic drinks of all kinds in Chicago (and potentially other cities as well), an important question has presented itself: which other American fast-food joints give their patrons the opportunity to get tipsy while they chow down? 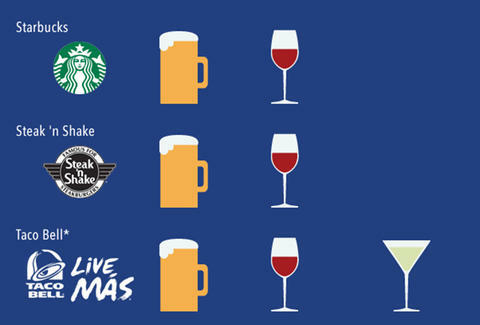 Recognizing the need for answers to this vital query, the folks at VinePair put together a straightforward infographic detailing which chains serve alcohol, the types of booze they have on offer, and their level of availability. While you probably already knew you could buy Modelos and margaritas at most Chipotle locations, you might not have realized that Sbarro sells wine -- or that some Sonics in South Florida will gladly serve you a beer with your meal, in case all those regular drink combinations aren't enough. Gianni Jaccoma is an editor for Thrillist, and he now needs to taste some Sbarro wine. Follow his low expectations on Twitter @gjaccoma.